This article is about a minigame in Super Mario 64 DS. For other uses, see Boom Box. 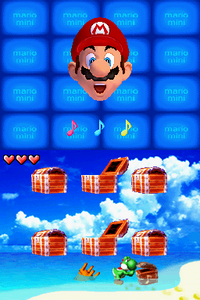 Boom Box is a minigame in Super Mario 64 DS. It is one of Yoshi's minigames, though Yoshi is only seen in the background pushing a treasure chest. It involves the player tapping a treasure chest on the touch screen to open it. When opened, the chest makes a sound, astonishing the Mario head on the top screen. For every chest that makes a certain sound, there is another chest that makes the same sound. The player must match all of the sounds with each other. As the player progresses, more chests appear. If the player makes a mistake, the Mario head frowns, while if the player succeeds, the Mario head beams at the player. If the player gets a Game Over, then Mario's face screams and looks dazed. When a player clears the round, Mario's face is astonished, then bursts out laughing. In most levels there are six treasure chests, however, some levels have eight treasure chests. In some levels, the sounds sound exactly the same and require the player to pay attention to which speaker the sound comes out of. Each time you open a treasure chest, you'll hear a sound. Open 2 chests with the same sound. Win by matching all the pairs! German Der Ton macht's Abbreviation/Pun on "Der Ton macht die Musik." Literally: "The tone makes the music." Actually means: "It's not what you say, but how you say it." Mario's laughter is based on him shouting when he catches on fire, and his sound when the player gets a Game Over is similar to him shouting when he is falling from a high place or a pit. This page was last edited on April 3, 2019, at 08:03.